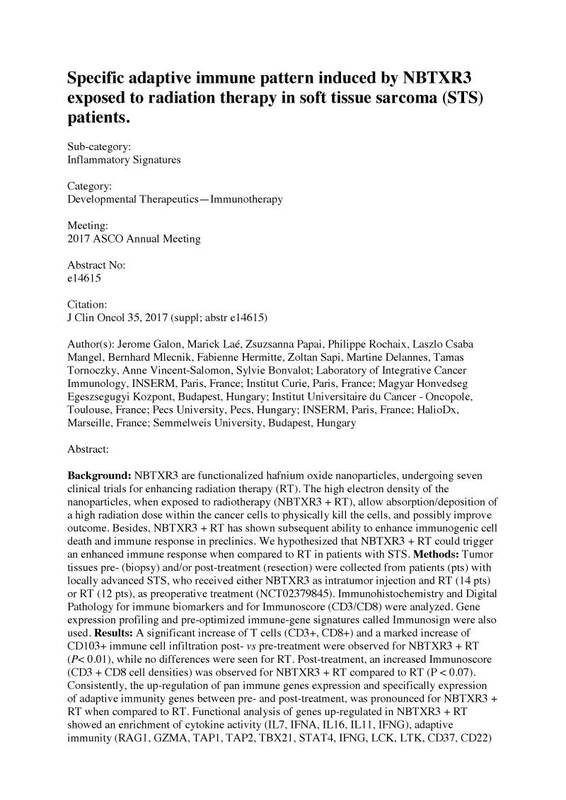 ASCO · 2017, Galon J. et al. Background: NBTXR3 are functionalized hafnium oxide nanoparticles, undergoing seven clinical trials for enhancing radiation therapy (RT). The high electron density of the nanoparticles, when exposed to radiotherapy (NBTXR3 + RT), allow absorption/deposition of a high radiation dose within the cancer cells to physically kill the cells, and possibly improve outcome. Besides, NBTXR3 + RT has shown subsequent ability to enhance immunogenic cell death and immune response in preclinics. We hypothesized that NBTXR3 + RT could trigger an enhanced immune response when compared to RT in patients with STS. Methods: Tumor tissues pre- (biopsy) and/or post-treatment (resection) were collected from patients (pts) with locally advanced STS, who received either NBTXR3 as intratumor injection and RT (14 pts) or RT (12 pts), as preoperative treatment (NCT02379845). Immunohistochemistry and Digital Pathology for immune biomarkers and for Immunoscore (CD3/CD8) were analyzed. Gene expression profiling and pre-optimized immune-gene signatures called Immunosign were also used. Results: A significant increase of T cells (CD3+, CD8+) and a marked increase of CD103+ immune cell infiltration post- vs pre-treatment were observed for NBTXR3 + RT (P< 0.01), while no differences were seen for RT. Post-treatment, an increased Immunoscore (CD3 + CD8 cell densities) was observed for NBTXR3 + RT compared to RT (P < 0.07). Consistently, the up-regulation of pan immune genes expression and specifically expression of adaptive immunity genes between pre- and post-treatment, was pronounced for NBTXR3 + RT when compared to RT. Functional analysis of genes up-regulated in NBTXR3 + RT showed an enrichment of cytokine activity (IL7, IFNA, IL16, IL11, IFNG), adaptive immunity (RAG1, GZMA, TAP1, TAP2, TBX21, STAT4, IFNG, LCK, LTK, CD37, CD22) and T cell receptor signaling pathway (CD28, CTLA4, CD274, BTLA, TIGIT, CD40LG, CD5, CD3E, ZAP70). Conclusions: NBTXR3 + RT induces a specific adaptive immune pattern. As such, it may contribute to convert “cold” tumor into “hot” tumor and be effectively combined with immunotherapeutic agents across oncology. These data warrant more tissue samples evaluation to reinforce these findings.